Perhaps you have a preppy Dad who looks great in khakis, a crisp white t-shirt and maybe even a letterman's sweater. If this is the case, then the perfect accessory gift you could give him this Father's Day is The Quad watch by Nixon. 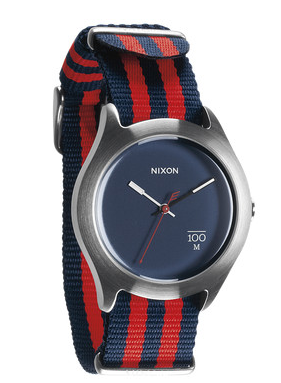 A classic and simple face with a touch of collegiate flair in the navy and red striped band.